Published on April 5, 2016 by Martyn. Be the first to comment! How lovely, then, to stumble upon the following review of Never Ending on an American blog. All the more so because the blog – Never Giving Up, Never Giving In – declares itself ‘dedicated to ending the stigma surrounding mental illness’. Dealing accurately and appropriately with Shiv’s mental-health issues was one of the main challenges in writing this novel, so I’m thankful (and relieved) that the reviewer endorses this aspect of her characterization. 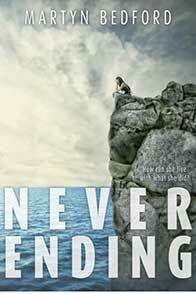 “Never Ending, by Martyn Bedford, explores concepts such as grief, trauma, family dysfunction and courage. In a nutshell, the main character, Shiv, is sent to an inpatient treatment facility to confront the death of her younger brother and the role that she played in the incident which killed him. I don’t want to give away too much about the actual plot of the book, especially since I think that you should read it yourself, but I want to talk about the themes because I think there is a lot that can be learned from Shiv’s experiences throughout the story. Dealing with Post-Traumatic Stress Disorder is a difficult task, especially when the sufferer feels as though they are to blame for the trauma. For me, this story really allowed me to take a closer look at the impact that trauma can have on the thought processes of an individual. I really liked how this book portrays the recovery process as being raw, painful, and incredibly difficult. The reader really gets to see the inside of Shiv’s mind and understand what she is feeling and thinking. In my experience not many books are able to do this accurately so I think that readers could learn a lot from this. More specifically, if you have experienced a trauma and want your friends and/or family to understand more about what you’re going through, perhaps reading this book could help them understand just how difficult it can be to overcome PTSD. Alternatively, if you have a friend or family member who has been struggling through the recovery process, perhaps reading this book might give you some insights into how you can be a supportive person for them or even just give you a better idea of what they might be going through. To read the review in full or to visit the excellent Never Giving Up, Never Giving In site, please click on this link.